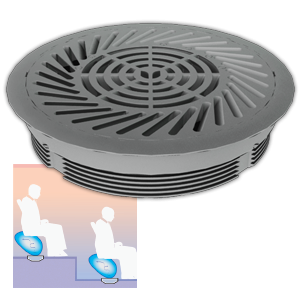 Single slot side-blow diffuser with high induction multi-swirl discharge, for installation in walls or bulkheads. 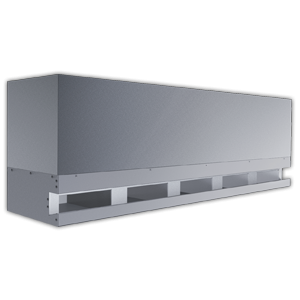 The SMARTEMP Linear Swirl Diffuser, type LSW-FD, has a row of rectangular chambers located in a recessed slot of galvanised sheet metal, which may optionally be powder coated. Air entry is from above (standard), or optionally from below (on request only). Each rectangular chamber discharges a pair of highly inductive, counter rotating supply air vortices. High induction and intense mixing at the diffuser discharge surface strongly dilute the swirling supply air streams with large quantities of room air. Rapid temperature equalisation with room air temperature is achieved, preventing cold air dumping, thereby ensuring uniform temperature distribution (no cold and draughty or hot and stagnant spots) and high comfort levels in the space. High induction also produces a strong increase in supply air stream mass flow rate, as well as rapid discharge velocity decay. 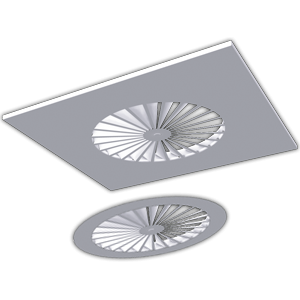 As a result, at any given airflow rate, the LSW-FD diffuser is suitable both for long throws (due to the high momentum of each supply air stream) as well as short throws (due to the supply air streams’ low velocity). The stable discharge characteristics of the LSW-FD diffuser operating at constant airflow over a wide range of supply air temperatures of up to ΔTsupply-room = -12 K ensure enhanced levels of comfort over horizontal throws of up to 16 m.
High induction counter-rotating swirl discharge intensely mixes supply air with room air. Strong supply air dilution with rapid discharge velocity decay produces draught-free, high momentum supply air motion for uniform temperature distribution over short or long throws. Ideal for enhanced thermal comfort (ADPI ≥ 90%). Air supply from walls or bulkheads. Slightly inclined discharge for extended horizontal air pattern projection above head height. Discharge chambers recessed within a horizontal slot. Diffusers may abut to form continuous linear aesthetic. Single horizontal slot. Metal Face: Powder coated sheet metal finish. 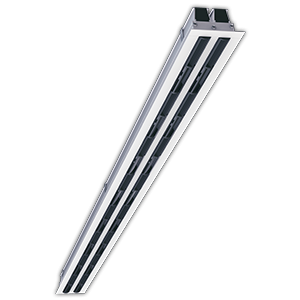 The SMARTEMP Linear Swirl Diffuser, type LSW-FD, is a high induction fixed discharge direction wall diffuser with a single visible slot containing a row of recessed rectangular openings that each discharge a pair of counter-rotating swirling air streams. The diffuser face is made of galvanised sheet metal, which may optionally be powder coated. Air entry is from above (standard), or optionally from below (on request only). Each rectangular chamber discharges a pair of highly inductive, counter-rotating supply air vortices. High aspiration and intense mixing at the diffuser discharge face strongly dilute the swirling supply air streams with large quantities of room air. High induction provides rapid temperature equalisation of each swirling supply air stream with room air, preventing cold air dumping, thereby ensuring uniform temperature distribution (no cold and draughty or hot and stagnant spots) and high comfort levels in the space. High induction also improves heating performance. High induction produces a strong increase in supply air stream mass flow rate, as well as rapid discharge velocity decay. 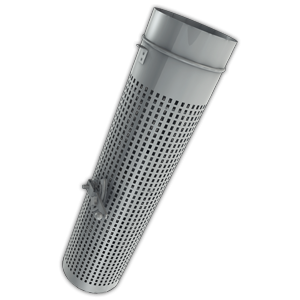 As a result, at any given airflow rate, the WL diffuser is suitable both for long throws (due to the high momentum of each supply air stream) as well as short throws (due to the supply air streams’ low velocity). The stable discharge characteristics of the WL diffuser operating at constant airflow over a wide range of supply air temperatures of ΔTsupply-room ≥ -8 K ensure enhanced levels of comfort over horizontal throws of ≤ 16 m with air diffusion performance (ADPI) exceeding 90%.